A man went to the zoo. All they had to exhibit was a dog. It was a shih tzu. This evening I wondered how many other jokes there were using the pattern “adjective + noun sounds like noun“. So I downloaded the CMU pronouncing dictionary, WordNet and cracked out a bit of Perl. So there is a new project making great strides on crowd-funding platform Kickstarter: Glowing Plants: Natural Lighting with no Electricity. The aim is to produce a genetically-modified houseplant which emits light – a pretty exciting concept. For me it brings back fond memories of 2010, when I was part of the University of Cambridge team competing in a genetic engineering competition called iGEM. 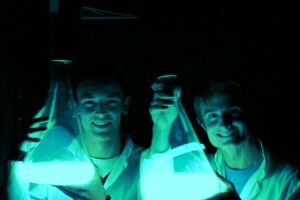 We focused on bioluminescence and over a summer made bacteria which could glow. Yours truly (right) lit by our bioluminescent bacteria. Disclaimer: they didn't seem nearly this bright. It wasn’t revolutionary – the sequences of DNA we used had been described in the scientific literature – but we packaged them in “BioBricks” so that other iGEM teams could assemble them with their own parts to make something new. For example, last year the University of Peking used our constructs to allow bacteria in different flasks to communicate. One of the applications we described for bioluminescence, and our original inspiration for the project, was the idea of glowing plants. Time constraints meant that we had to limit ourselves to bacteria, which take hours and not months to grow. 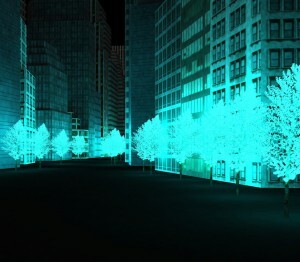 But nobody can deny that the idea of walking down a path lit by glowing trees is pretty enticing. 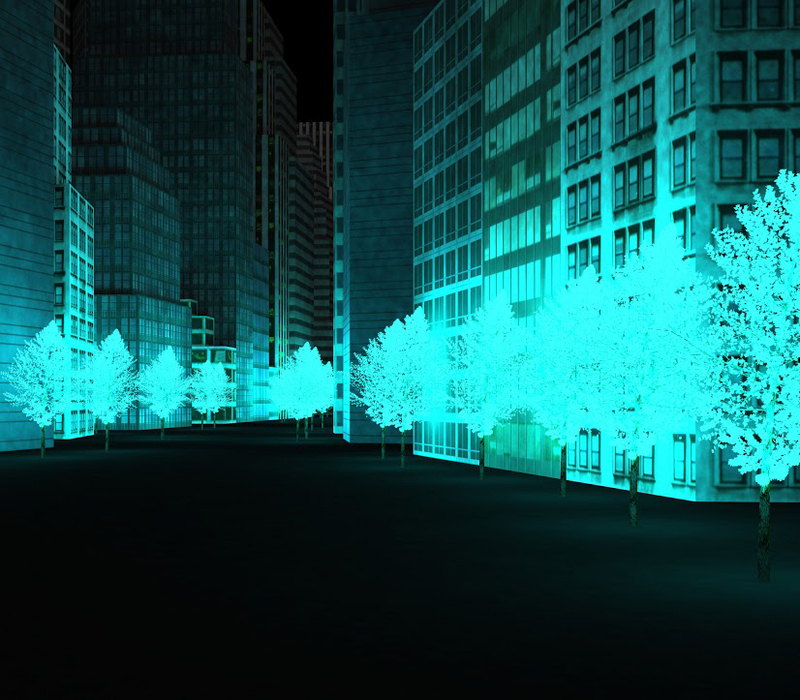 We took many photographs of our bacteria, but the image that attracted most attention was a 3D mockup depicting how a city lit by bioluminescence might look. Now these ideas have served as the inspiration for this Kickstarter project, headed by Omri Amirav-Drory and Antony Evans. The response has been very impressive. In just three days, it has exceeded its initial $65,000 goal. So is this the model for scientific funding in future? Not quite, I think. What has dissapointed me has been the lack of discussion as to what the team actually plan to do with the funds raised, and whether the science stacks up. To be fair to the team, they are perfectly happy to discuss it, and they have shared their DNA designs using their Genome Compiler software (the project serves in part as a case-study for it). But most of those who have donated have done so without seeing these, or without even asking for second opinions. So here is some more information, and some personal thoughts, about the science behind this project. What do they plan to synthesise? Any discussion of bioluminescence inevitably involves fireflies, probably because they are the sexiest of the bioluminescent menagerie. The firefly luciferase enzyme is indeed used in laboratories to emit light for measurement. The problem for applications like this is that we do not yet understand how fireflies make the fuel, called luciferin, that powers the luciferase. This means any plant would have to fed this very expensive luciferin, and simply wouldn’t be viable. There are a number of other “luciferases” in nature, each with their own “luciferin”, but it is important to realise that these are for the most part entirely independent evolutions with different chemical structures. They are not cross-compatible. 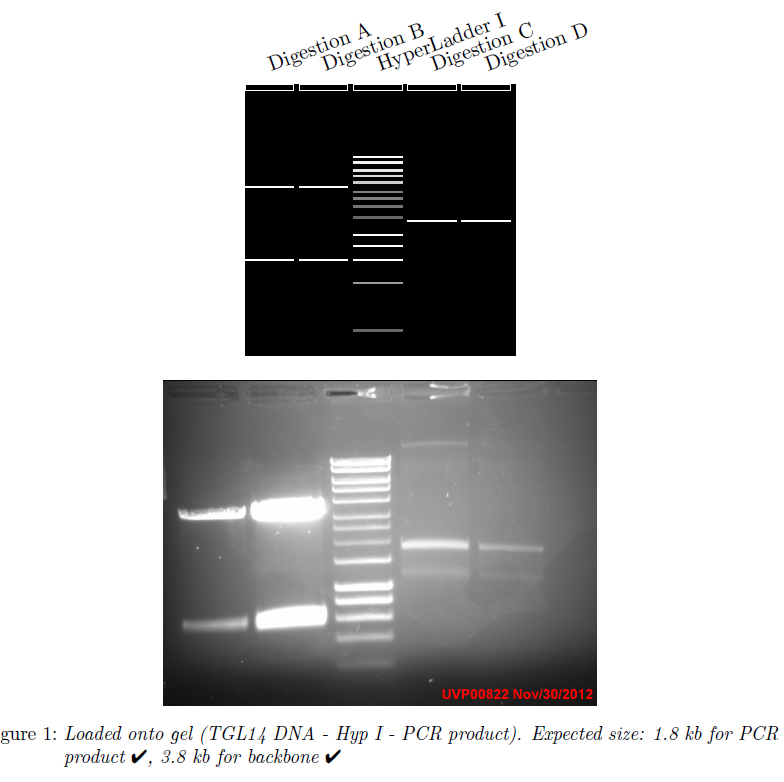 This project plans to use the luxCDABEG operon from Vibrio fischeri to emit light. V. fischeri is a bacterium which lives in symbiosis with squid. 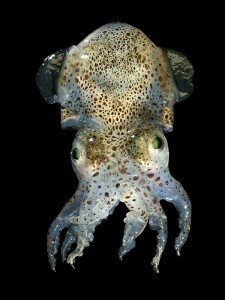 It lives in a specialised part of the squid’s body called the ‘light organ’ and emits light to camouflage them from predators. This operon of genes encodes both proteins which emit light, the luciferase, but also those involved in producing the luciferin fuel from basic building blocks. I would absolutely agree that currently this is the best (and probably only) way to make an autonomously bioluminescent plant. As the team acknowledge, the first plant was engineered for bioluminescence in 1986 – when tobacco was made to express firefly luciferase, prompting this iconic picture. However, as discussed above, this plant had to be fed luciferin to allow it to glow. 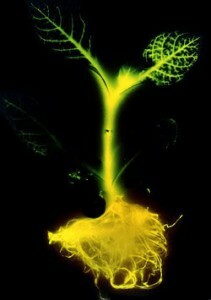 A self-sufficient luminescent plant is a very different beast. However, self-sufficient glowing plants have been made before, though to my knowledge only once. This paper from 2010 describes the creation of a tobacco plant expressing the luxCDABE operon from V. fischeri. There were some hurdles before this achievement. One of the complications of synthetic biology is the differences between bacteria and plants. LuxCDABEG is an ‘operon’ meaning that it is a set of six (alphabetised) genes, which are read off the genome in one go. But plants, like ourselves, don’t have operons. They process each gene as a separate transcript. This would mean a lot of re-engineering to split the operon into six. Except for one thing, plants contain chloroplasts for photosynthesis. Chloroplasts are the descendants of bacteria that entered a symbiosis with plants long, long ago. They retain the ability to read DNA in operons, and so the authors of this paper exploited that by inserting the operon into the chloroplast genome. their glow was clearly seen after about 5–10 min of eye adjustment to darkness. This sounds perhaps a little dimmer than our bacteria, but a similar order of magnitude. (Unfortunately the darkest room we had access to was a walk-in fridge, so we shivered excitedly as we saw our first glowing bacteria). Brightness levels are very difficult to communicate. Photographs don't work because you can make anything look bright by increasing exposure time. The best description I can give of our light levels was that a flask of bacteria allowed enough light to read (after adapation), but only just. All this means that the organisers shouldn’t really claim this will be ‘the world’s first glowing plant’. 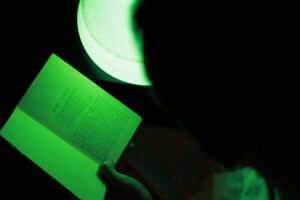 However it is likely to be the first glowing plant that you can get your hands on, and that is clearly important. If the public do get their first glowing plants from Kickstarter, it will really prove the democratising effect of this approach to funding. 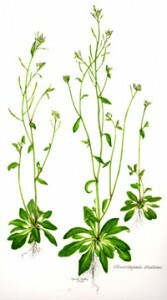 The Kickstarter project plans to replicate the results obtained in tobacco, this time in the small weed Arabidopsis thaliana. This is a sensible choice of plant because it is easy to genetically manipulate, but it is difficult to say whether we can expect more or less brightness. They plan to increase the brightness by ordering DNA with a composition more similar to chloroplast DNA than bacterial DNA (a process called codon optimisation). This technique can sometimes radically increase expression levels. In this case, because chloroplasts are bacteria, their DNA composition (‘codon usage’) is actually similar to that of V. fischeri. This makes me doubt there will be a major effect, but the only way to know is to try. They also hope to try a number of promoters to activate the operon in order to find one which maxmises expression. They have a number of other hypothetical designs in Genome Compiler, including one which would switch the light on only in the dark, and one which would give the plant the smell of fresh rain. One of their designs is an approach I am particularly interested in: it inserts the operon into the plant’s nuclear genome instead of the chloroplast’s. This would require re-engineering the operon to insert ribosomal skipping sequences between the genes of the operon so that the plant can understand that it is six genes and not one long gene. I have no evidence at all that it would work better, and there are arguments it could be worse because there are many chloroplasts per cell, but I think it could have promise. How do we get brighter light? My prediction is that this project will ship plants which have a dimly visible luminescence in a pitch-black room. That will be an exciting prospect in itself for me. With the current trajectory of the Kickstarter, the organisers may have funds left over to improve the product. The first ‘stretch-goal’ they have announced is to create a glowing rose. Cool, and good for publicity, but I think what we’ll really want is a brighter plant, of any type. This is going to involve a better understanding of what the limiting factor for bioluminescence is. Our bacterial bubble lamp made it pretty clear that in a bacterial culture, this was oxygen levels. We put a fish-tank bubbler into the culture, which added oxygen to vastly increase the brightness levels. In a plant the limiting factor could be the amount of a particular enzyme, or the amount of oxygen, or the amount of long-chain aldehydes needed as a basic fuel, or some other factor. Hopefully if the researchers find out what it is, they may be able to do something to widen this bottleneck and increase light output. All in all it’s an exciting project and I wish its organisers every success. I hope they find time to fill in their wiki with some more details of the science they plan to do so that the people of Kickstarter know where their money is going. And I hope that the people of Kickstarter start to ask for some of these details before they fork over their money. That could make for pretty effective science funding platform. Author Theo SandersonPosted on April 27, 2013 September 17, 2014 1 Comment on Crowd-funding Avatar? Update: Up-Goer Six can colour code text you have already written. Thesaurus added to UG5, it’s from here with credit to jbonhag. Update2: Now available in Norsk and Español + Español 5K. A few months ago Randall Munroe from xkcd drew a beautiful labelled diagram of the Saturn V rocket. However, it was not titled Saturn V because Mr Munroe had decided the diagram would use only the thousand most common words in the English language to try to explain how this complex vehicle worked, hence ‘Up-Goer Five’. Seeing the contortions he endured to express himself in this restricted format, but the increased clarity it sometimes gave, I thought it would be interesting to try out writing with it myself. I hacked together an editor which would complain if you used any word not on a particular list. Now, what list to use? Of course which words are used depends very much on what you are reading. Newspapers will be different to scientific papers, which will be different to novels. In the end I opted for consistency with the original comic. Some sleuthing by xkcd fans revealed that Mr Munroe used the contemporary fiction frequency list available on Wiktionary. (To make this tool maximally useful, a more rounded set of words like this might be better.) I used the Automatically Generated Inflection Database to make sure I had every derivative of these 1000 words – leading to some odd words like ‘themselveses’ being allowed! I decided I might as well let everyone else try it, and gave it a bit of visual sprucing. Since then I’ve added a couple more features, like the ability to see what other people have been writing with the [RANDOM] button, and the ability to define terms using ‘quotes’. But it remains a very basic page. I thought I’d dash off a post, mostly to answer endless discussions about why the words allowed are the ones they are. Check out the latest uses at #UpGoerFive!